It’s that time of year again, when the weather is so dry that your skin starts cracking and bleeding due to the dropping temperatures. Last year, my hands and legs were always dry. Not only would they itch, but it wasn’t too cute looking. This year, I decided that I would take matters into my own hands and start caring for my skin better to prevent any dryness. Ulta has always been my go-to store for purchasing all of my beauty and bath products. Their aisles are clearly labeled with the types of products offered—prestige, drugstore, all-natural—and their displays are always eye-catching. When I was walking around, I stumbled upon Being by Sanctuary*. The flirty packaging with bold red lips and watercolor fruit images captured my attention at first. And being someone who has a super strong sense of smell, I decided that I would check out all of the different fragrances because I’m not a fan of super artificial and intense smells. All of Being’s products smelled amazing, and I knew that I wanted to give them a try! As you all probably know, I only purchase and use brands that are cruelty-free. Thankfully, all of Being’s products are clearly labeled that they do not test on animals—and that they’re free of parabens and harsh chemicals (Read their FAQs here, because it’s super cool how they ensure all of their products and ingredients used are cruelty-free.)! After a long day of class, finals preparation, and an intense sweat session, I decided that I would pamper myself. I took a long warm shower and started off by exfoliating my skin with the Being Body Scrub to remove any dead skin. Then, I used my Being Shower Burst foaming wash. You guys, this stuff smells amazing and unlike other soaps, my skin didn’t feel dry afterwards but instead, refreshed and clean. In order to make sure my skin would be hydrated the next morning, I applied the Being Body Butter all over my legs and arms. Not only does this lotion smell like coconut water and flowers (I have the hibiscus and coconut water scent), but it absorbs into your skin without leaving a greasy residue. The next morning, I woke up with soft skin that smelled and looked great. This winter will not be the winter in dry skin. Thanks to Being, I’m embracing soft, smooth, and delicious smelling skin. 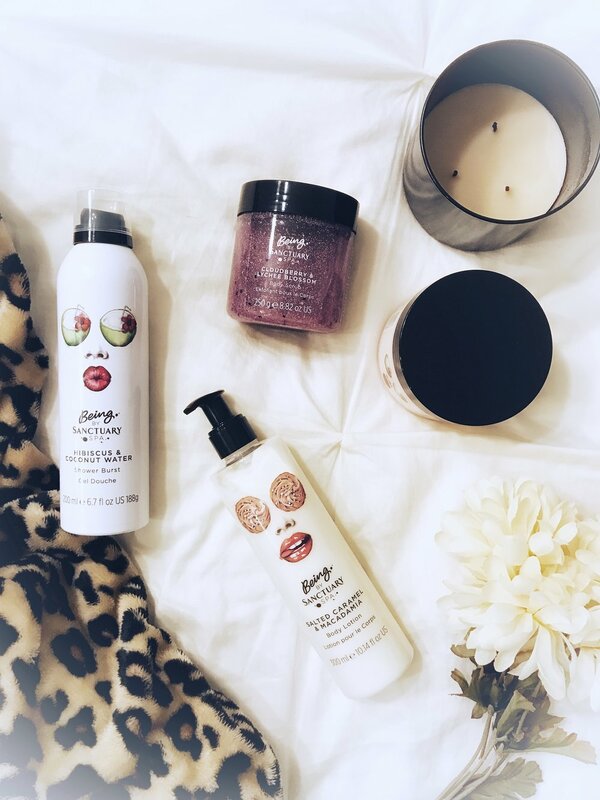 What's your winter spa routine? How do you make sure your skin look bomb in the winter? Let me know in the comments below, I'd love to find new ways to keep my skin extra hydrated. * This post was sponsored by Being x Sanctuary. The products featured in this post were sent to me for free from Being x Sanctuary. Like always, all opinions of the products are my own. Thank you!